The Department of Biological Sciences at the University of Pittsburgh invites applications for a 2-year Postdoctoral Fellowship in Ecology and Evolution, broadly defined (e.g., disease ecology, microbiome, behavioral ecology, species interactions, phylogenomics, population genetics, community and eco-evo dynamics). The goal of the EE Postdoctoral Fellowship is to broaden expertise and to stimulate synergistic interactions between faculty interested in the area of Ecology and Evolution.The successful candidate will be expected to conduct original independent research that bridges the interests of two or more faculty members in the Ecology and Evolution sections of Biological Sciences and to lead a graduate seminar in their area of expertise each year. Qualified candidates are required to submit a single, coherent 2-year research proposal to be completed under the guidance of two or more members of the ecology and evolution faculty in the Department of Biological Sciences of the Dietrich School of Arts and Sciences (https://www.biology.pitt.edu/research/ecology). The position does not include research funds so the extent of contributions from the faculty sponsors should be addressed in the proposal. We strongly encourage candidates to contact appropriate faculty sponsors before applying. Preference will be given to candidates with novel ideas, demonstrated research ability, and strong communication skills. Along with the research proposal, applications must include a CV, a short description of research accomplishments and a description of how your research, teaching or service demonstrates a commitment to diversity and inclusion. The applicant must arrange for two recommendation letters from non-UPitt faculty, and letters from the UPitt faculty sponsors to be emailed to the address below. The expected salary will be $48,000 per year with benefits. Application deadline is April 1, with position start date June-August 2019 (specific date negotiable). Application materials should be emailed to: Dr. Tia-Lynn Ashman at: [email protected] The subject line should read “EE Post-doctoral application”. We are happy to welcome Trieste Devlin as our new Field Assistant. Trieste has a B.S. in Robotics Engineering from UC Santa Cruz, and will be working on a variety of projects related to our acoustic recorder hardware development as well as to our field deployments. We are happy to announce that the Kitzes Lab has been awarded an AI for Earth Innovation award from Microsoft and National Geographic. Our proposal was one of 11 funded projects, which each receive financial support as well as Microsoft Azure credits for cloud computing work. This funding will specifically support our development of our open source acoustic classification software, OpenSoundscape, as well as our efforts to release 600 classifiers for North American bird species by the end of the year. Read more from National Geographic, Microsoft, and Pitt. 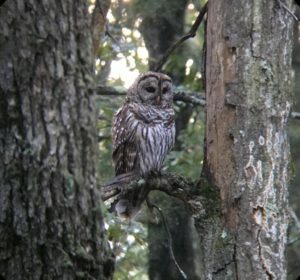 The Kitzes Lab at the University of Pittsburgh’s Department of Biological Sciences (http://kitzeslab.org) is seeking a Field Assistant to assist with research studying the spatial distributions of bird and bat species at landscape scales. The Kitzes Lab is currently placing autonomous acoustic recorders throughout landscapes in western Pennsylvania to record ambient sounds. This data is then processed to identify the species present near each recorder and their relative activity levels, which we analyze to determine the factors that influence where organisms are found and why. Assisting in processing the data collected by these recorders. Training will be provided, and applicants may have the ability to expand tasks to include greater responsibilities. This position is available initially for one year, with an extension for a second year available pending a positive first-year review. We may be able to provide flexibility in work hours and location, if requested by applicants. For more information, and to apply for the position, please visit https://www.pittsource.com/postings/175646. We are happy to announce that Justin has been awarded a Faculty Scholarship from the Mascaro Center for Sustainable Innovation, He will use the award to support all of the lab’s projects, with a particular focus on the development of our acoustic recording hardware and classification methods. This work will be done in collaboration with members of our lab and students and faculty in the Swanson School of Engineering. Relatedly, Dr. Kitzes is also a member of the Sustainability Task Force as the Mascaro Center – see the Pitt Sustainability Plan for more information on this work. After weeks of preparation involving the entire lab—shout out to our undergrads Lydia and Kyle for weeks of tirelessly programming hundreds of units—Lauren and Tessa have deployed nearly 200 AudioMoths along a 20km transect in Sproul State Forest, located in north-central Pennsylvania. (For more about the history and significance of this study site, check out Lauren’s recent blog post!) This is our first major transect and we are excited to get some data to play around with through the winter! 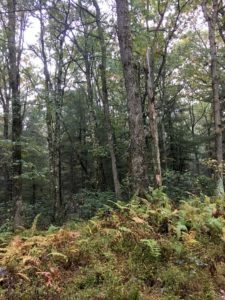 Nearly 200 AudioMoths were strapped to trees along a ridge in Sproul State Forest. All photos by Lauren Schricker. Our current set-up involves a sandwich bag and a desiccant pack to prevent moisture from reaching the AudioMoth hardware. It’s resourceful, low-cost, and seems to work for now, but we are exploring options for creating weatherproof cases for the AudioMoth. Nothing can save the AudioMoths from Pennsylvania winters, though—we don’t think they’ll survive freezing temperatures. They’ll return to the lab before the first frost, which we can probably expect sometime in November. If our two-day trip along the transect was any indication, we can expect to hear a multitude of species on the recordings. While we are specifically only listening for birds at this time, we saw three young black bears within minutes of arriving in the forest. We heard tons of songbirds as well as Pennsylvania’s state bird, the ruffed grouse. 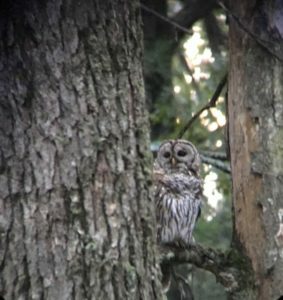 Most excitingly, as we paused to let some white-tailed deer cross the road, a barred owl was spooked into flying a little closer to us. Although the deer startled her, we seemed to pique her curiosity, and we spent about a half an hour checking each other out! Can you spot her in the photo below? She’s just to the right of the biggest tree in the middle, about halfway down the trunk, staring straight into the camera! Will we manage to find her or any of her conspecifics on the AudioMoth recordings? Stay tuned to find out! Lauren Schricker is joining the lab this semester as our first grad student! She’ll be mostly running our large scale bird survey field projects, while also joining in many of our other lab interests. Like many of us around here, Lauren has a diverse and interdisciplinary academic background, with a B.S in Geology (Allegheny College) and a P.S.M. in Environmental Management and Sustainability (St. Edward’s University). You can read more about Lauren on her personal website. Welcome! 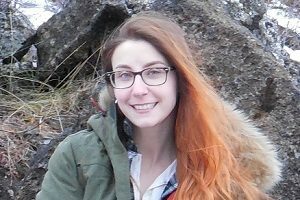 Tessa Rhinehart is joining the lab as our new Research Programmer. She’ll be working mainly on our bird call classification algorithms and software, and also helping out with our field surveys and other lab projects. Tessa comes to us via Swarthmore College, where she was an undergraduate Mathematics and Biology major – she also happens to be quite the birder. Welcome Tessa! The Kitzes Lab at the University of Pittsburgh’s Department of Biological Sciences (http://kitzeslab.org) is seeking a Research Programmer to assist with research studying the spatial distributions of bird and bat species at landscape scales. We are seeking an experienced data analyst and programmer to support the development of algorithms and software to identify the species present in these recorded sound files, as well as to assist with the placement and retrieval of recorders in the field. – Experience programming in Python (or a similar language), and the ability to rapidly learn new languages and techniques, as needed. – Experience working with development tools and platforms such as GitHub, Docker, and Amazon AWS. – Experience with machine learning and/or classification methods. – Experience with statistical modeling, including mixed models and/or Bayesian analysis. – Experience working in Unix/Linux environments. – Experience with Raspberry Pi’s, UDOO boards, or other single board computers. – A working knowledge of the principles of audio recording, amplification, or analysis. – The ability to walk up to three miles on uneven terrain. For more information, and to apply for the position, please visit https://www.pittsource.com/postings/148476.